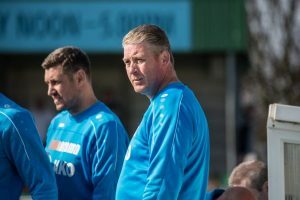 Alun Armstrong has heaped praise on the travelling Green Army – admitting it’s the best he’s ever seen as Blyth Spartans manager. The excellent 289 Blyth fans were dealt a cruel blow in the 84th-minute as Jamie Turley headed home a Leyton Orient winner, preventing a FA Trophy last 16 replay at Croft Park on Tuesday. The away supporters out-sang the Orient-faithful throughout the afternoon before passionately showing their appreciation for their side’s superb efforts at the full-time whistle. “It’s the best I’ve ever seen,” said Armstrong. “They were brilliant and I was more gutted for them because it would have been great to get Orient back to Croft Park – imagine the noise we would have got there! “They’ve came such a long way and they haven’t stopped singing all game. Playing at the home of a former Football League club, against the National League leaders, in front of a 1800+ crowd – Armstrong believes it shows how far the club has come since his arrival in 2016. He said: “It was devastating to lose in the way we did but we’ll take massive satisfaction from what we done today.